‘Tis the holiday season and what better way to share the spirit than with Chocolate Cranberry Brownies. Because fresh cranberry season goes by so quickly, I like to take full advantage of this tart fruit while I can. 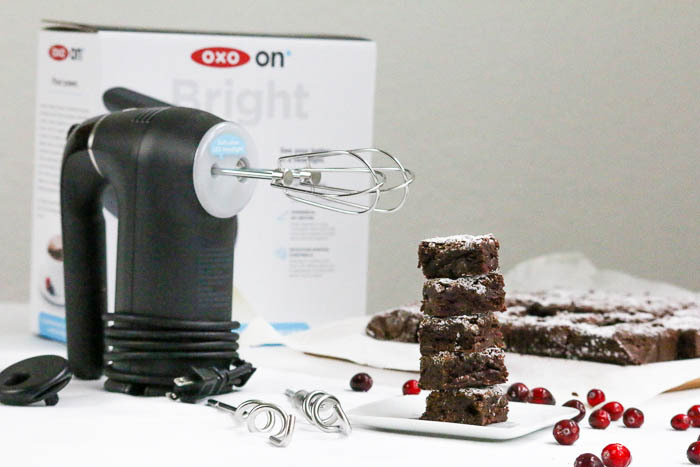 When I received an email stating that OXO is planning a campaign about mixing up the holidays and that one of the highlights is OXO’s new OXO On Illuminating Digital Hand Mixer, I knew I wanted in. I was, totally, intrigued by the thought of a hand mixer that would, literally, shed new light on the batter and dough being mixed. I have a hand mixer that is older than my 24 year old son so you can only imagine my excitement as I waited for my package to arrive. What I discovered is that OXO’s mixer is wonderful for more reasons than the light. I chose Chocolate Cranberry Brownies because I knew that the batter would work nicely using a hand mixer. The blades insert easily into the body of the mixer and the weight is well balanced, while it is running. My favorite feature is that it stands flat on the counter as I am adding other ingredients. No more batter drippings on my countertops. I, also, love that the chord wraps neatly around the base for storage so no more mangled chords, either. After the cranberries are cooked and cooled, they are folded into the batter. The tartness of the cranberries works in tandem with the sweetness of the batter and the chocolate chips. 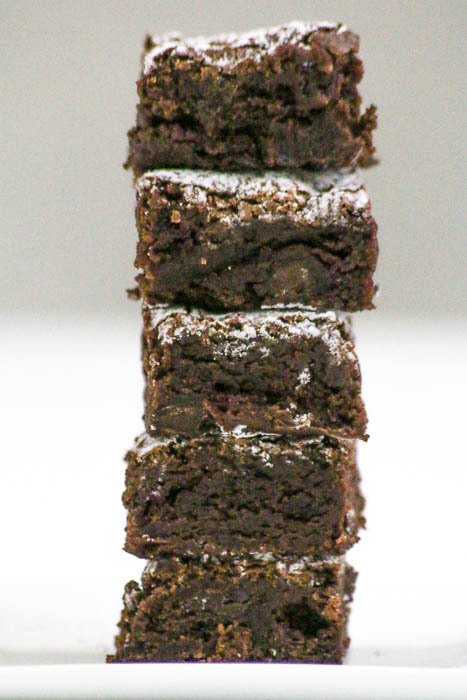 Chocolate Cranberry Brownies really are a perfect way to celebrate the season. Place the cranberries, sugar, cinnamon and water into a medium sauce pan. Cook over medium heat until all of the mixture is thick. Set aside to cool completely. Melt the butter and unsweetened chocolate in a large bowl. Beat in the sugar. Add the eggs, one at a time followed by the vanilla. Mix in the dry ingredients. Stir in the cooled cranberries and chocolate chips. Bake at 350º for 40 minutes. Remove from the oven and cool completely before cutting. Additional time is needed for the cranberries to cool. An OXO On Illuminating Digital Hand Mixer was provided to me. All opinions expressed herein are those of the author, and are not indicative of the opinions or positions of OXO. Cranberries are usually pretty tart, but adding chocolate to this yummy combo sounds sweet and amazing. YUM. That mixer sounds awesome. I don’t have a hand mixer in my kitchen. And this recipe sounds delicious! Thanks so much. OXO’s hand mixer is fantastic! I really love using it. These brownies look absolutely mouthwatering! Thank you! I LOVE reading this!! Love adding cranberries into recipes this time of year too! I must make these little beauties! Loved your video and that awesome mixer too! Thanks so much. The mixer is fabulous and the cranberries are such a fun addition. I love the idea to add cranberries to brownies, these sound fabulous! Wow these sound so fantastic! 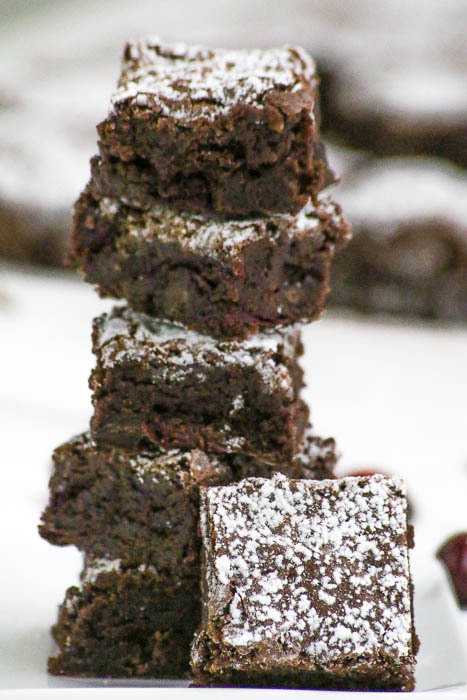 I never ever thought to add cranberries to brownies and they sound delicious! Thank you, Erica. Cranberries work beautifully with chocolate. They just need to be sweetened up first! What a unique idea! I’ve never heard of a recipe like this. It sounds real yummy too. Thank you. It’s fun to try something different. I love that you put fresh cranberries in these brownies! I am going to do this!! WOOHOO, Michelle! This makes me so happy! Thanks for sharing a very good recipe! Just a note: The ingredients calls for 1/2 teaspoon of vanalia extract but your instructions never say to use it. Thanks so much for pointing this out, Jim. I greatly appreciate the extra eyes! !